The Agile Octopus tariff has attracted a lot of attention, and rightly so. It’s a real breakthrough: a smart energy tariff that harnesses renewable generation by varying its price with the wholesale price throughout the day. While its most eye-catching feature is that it can sometimes pay you to use energy - and would have done so on four occasions over the last 12 months – there is a bigger story here. The ‘wholesale’ price energy companies pay for the power they sell varies both throughout the year and throughout the day based on a vast range of factors, such as the import price of gas, the weather, and how much demand there is. When energy companies provide you with fixed prices, they’re essentially offering insurance policies to manage that variability. These insurance policies add to the cost of energy for consumers – so if a customer is happy to accept variable pricing, they’ll probably save money in the long run through simply not having to pay for the insurance policies. Importantly, half-hourly wholesale electricity prices are typically quite low at most times outside of the 4pm-7pm peak. If your electricity consumption largely outside this time, you may well be better off with a tariff which reflects wholesale pricing. In terms of energy consumption outside of peak periods, this may be quite a natural fit for a lot of people. For example, many people with electric vehicles charge them overnight; and people with electric heaters can choose to have them on overnight and during the day, but turn them off at peak times and rely on the heat they've already built up. In many ways, it's like an Economy 7 tariff, but with 21 hours of off-peak energy rather than 7. While we still expect the vast majority of customers to choose our more traditional tariffs, the Agile Octopus is a good choice for people who want to experiment with cutting bills by changing habits, or the increasing number of people who are reducing their carbon footprint by shifting to electric heating or vehicles. We estimate that a typical dual fuel household using 3,100 kWh of electricity per year, and which then acquires an electric vehicle using an additional 5,000 kWh per year (about 15,000 miles) would have saved £669 compared to a Big 6 average standard variable tariff (SVT), and a couple of hundred pounds compared to our own 12 month fixed tariff over the last 12 months. What you can see is that the Agile Octopus would have been about 45% cheaper than the standard variable tariffs from the Big 6 (about 9p for the Agile Octopus vs 16.4p for The Big 6) all the time except 4pm-7pm. Indeed, it would also be about 1/3 cheaper than our own cheapest fixed tariff. 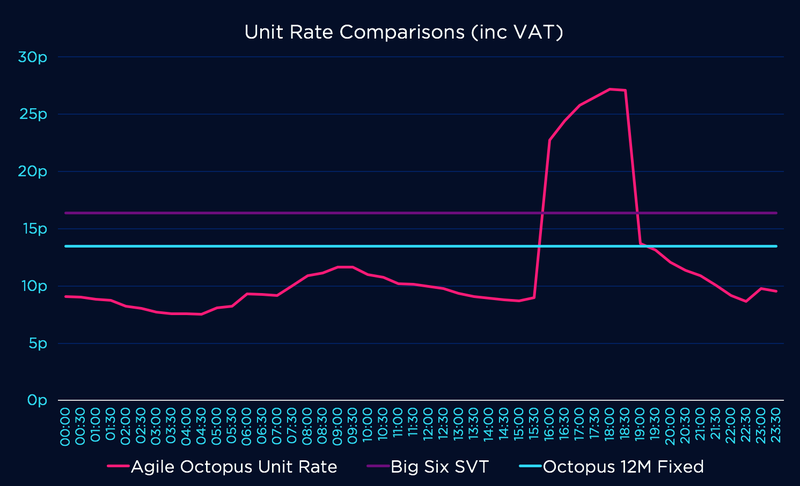 However, for the 2.5 hours from 4pm-7pm the Agile Octopus would reflect the high demand on the grid and cost around 25p – about 50% more than the Big SVT and about 85% more than the Octopus fixed tariff. So if you can consume most of your electricity outside of those 2.5 hours, the Agile Octopus is a big saver. If not, you may be better off with a more traditional tariff. These figures are averages – and of course each day may be different. That’s why we alert customers to peaks and plunges. The grid prices – and thus the Agile Octopus price – are set at 4pm each day for the next day. If there are going to be particularly expensive or cheap periods, we’ll let you know so that you can choose whether to adopt any consumption accordingly. For example, it typically costs about 9p to do a washing load at off peak times, but with the worst surges it could cost about 36.5p so you may choose to hold off for a bit. Octopus wants to make this tariff a positive experience for those who are interested in more actively managing their energy more actively. So, to take the sting out of the market volatility we do cap the maximum price you will pay at 35p/kWh for your electricity. And, as with all Octopus tariffs, there are no exit fees – so you switch to another tariff at any time you don’t like the variability, or are worried about a period of high prices. Agile Octopus is 100% renewable electricity, so our customers will be directly supporting solar and wind energy. Even more significantly, they could be helping the whole grid to become more green. What is exciting about Britain’s transition to renewable energy is that the ‘fuel’ for these power stations – mostly wind and sunshine – is free. 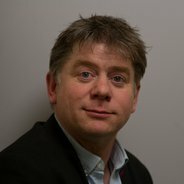 The price energy suppliers pay for that power is actually a combination of the cost of building them in the first place (a ‘fixed’ cost that we can’t change) and managing the grid to allow for the fact that the wind doesn’t always blow at the same time we are using lots of energy (a ‘variable’ cost). This variable cost can sometimes even go ‘negative’ to incentivise energy use during peak generation. And, as we get more renewable generation coming on to the grid, it is a factor that will become more and more significant. If we can shift demand to when there is lots of spare renewable energy, we can pass on the savings on the variable cost to customers and ultimately support investment in more renewable generation. At the end of the day, it has got to be a good thing to help people choose to use electricity at times it’s cheaper. This is critical to avoid massive expense in renewing the grid and increase the economic viability of renewables. Together, these forces can save the nation billions of pounds in infrastructure and speed up the adoption of a more sustainable approach to energy - all while saving customers money in return for consuming electricity slightly differently. This tariff won’t get us there on its own, but the innovation we’ve made is the first step on the road for the UK’s journey towards a more sustainable energy future - and we are so excited to see how customers respond.